Euro coins intended for circulation have legal tender status throughout the euro area. For the purpose of informing the public and all parties who handle the coins, the Commission publishes a description of the designs of all new coins (1). In accordance with the Council conclusions of 10 February 2009 (2), euro-area Member States and countries that have concluded a monetary agreement with the European Union providing for the issuing of euro coins are allowed to issue commemorative euro coins intended for circulation, provided that certain conditions are met, particularly that only the 2-euro denomination is used. These coins have the same technical characteristics as other 2-euro coins, but their national face features a commemorative design that is highly symbolic in national or European terms. Description of the design : Enrico De Nicola, provisional Head of State, signs the act of promulgation of the Constitution of the Italian Republic on December 27, 1947; on his right, the Head of Government Alcide De Gasperi, on the left, Umberto Terracini, President of the Italian Constituent Assembly. 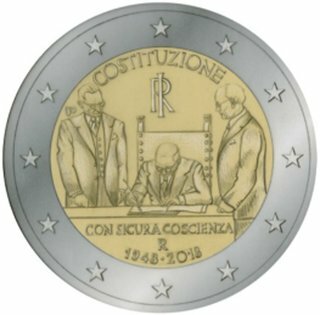 Above, the inscription ‘COSTITUZIONE’ and the monogram of the Italian Republic ‘RI’; in exergue, the inscription ‘CON SICURA COSCIENZA’, ‘R’, the mintmark of the Mint of Rome, and the dates ‘1948 • 2018’, respectively year of the coming into force of the Italian Constitution and year of the issue of the coin. (1) See OJ C 373, 28.12.2001, p. 1 for the national faces of all the coins issued in 2002. (2) See the conclusions of the Economic and Financial Affairs Council of 10 February 2009 and the Commission Recommendation of 19 December 2008 on common guidelines for the national sides and the issuance of euro coins intended for circulation (OJ L 9, 14.1.2009, p. 52).